The first six months of the fiscal year 2017 unfolded as forecast at the end of the fiscal year 2016. Order intake during the first half year (April to September) was slightly below the prior-year figure, while sales increased in both divisions. Operating income for the first half declined by CHF 3.2 mn compared to the prior-year period and net income was down by CHF 1.3 mn. Ongoing cost-cutting programs and the integration of recent acquisitions are progressing as planned. Management guidance for the entire fiscal year remains unchanged. Consolidated order intake for the first six months of the current fiscal year amounted to CHF 212.6 mn, or 4.5% less than in the prior-year period. Orders received in the Systems Division declined by 4.8% to CHF 117.7 mn amid a highly competitive market environment. Order activity in the division’s targeted market segments varied. In the gas transport and storage market, incoming orders for marine compressors remained at a low level. Meanwhile, orders in the petrochemical & chemical and refinery segments continued to climb. For the first time in quite some time, a Hyper Compressor project including a booster primary was tendered in the petrochemicals segment and Burckhardt Compression was pleased to win this contract. Business in China was pleasing; thanks to the acquisition of Shenyang Yuanda Compressor, we were able to strengthen our leading position in this target market. Order intake at the Services Division amounted to CHF 94.9 mn. This is slightly below (–4.3%) the high figure reported for the prior-year period and can be traced to a drop in demand for spare parts. Demand for services remained strong as before. The acquisition of the Canadian firm CSM Compressor Supplies & Machine Work Ltd. in Edmonton and the collaboration with Kompressorteknik ML AB in Ludvika, Sweden, strengthened the Services Division’s local presence in markets with good growth potential. Arkos Field Services in Texas (minority shareholding) profited as business in the upstream market recovered. 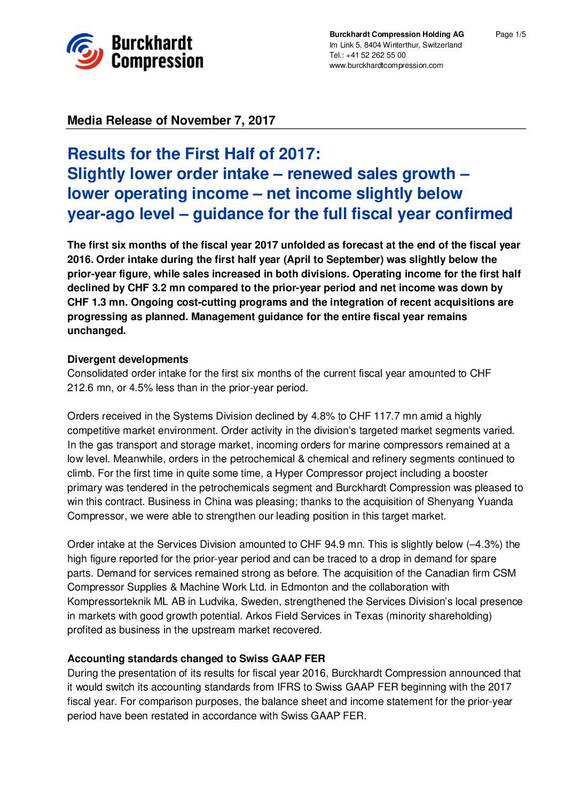 During the presentation of its results for fiscal year 2016, Burckhardt Compression announced that it would switch its accounting standards from IFRS to Swiss GAAP FER beginning with the 2017 fiscal year. For comparison purposes, the balance sheet and income statement for the prior-year period have been restated in accordance with Swiss GAAP FER. Group sales rose by 6.5% year-on-year to CHF 287.0 mn during the first half. First-half sales at the Systems Division amounted to CHF 192.8 mn, which topped the figure of CHF 186.2 mn reported for the prior-year period by 3.5%. In the Services Division, sales climbed 13.0% year-on-year to CHF 94.2 mn. Consolidated gross profit for the first half of the fiscal year amounted to CHF 54.9 mn (prior-year period: CHF 61.6 mn), resulting in a gross profit margin of 19.1% (prior-year period: 22.9%). Gross profit in the Systems Division was down 34.5% to CHF 11.4 mn, resulting in a gross profit margin of 5.9% (prior-year period: 9.4%). This contraction is largely attributable to an unfavorable product mix, the completion of several strategic projects with very low margins and underutilized production capacity. Gross profit in the Services Division was virtually unchanged (–1.6% to CHF 43.5 mn), bringing the gross profit margin of 46.2% for the period well below the level reported for the first half of fiscal year 2016 (53.0%) because of the changed product mix. Selling, marketing and general administrative expenses totaled CHF 40.8 mn, which is CHF 0.7 mn or 1.7% less than in the prior-year period. Research and development expenses of CHF 3.8 mn were CHF 0.6 mn less than in the prior-year period. Other operating income and expenses of CHF 2.5 mn are well above the comparable year-ago figure of CHF 0.3 mn. The increase largely reflects exchange-rate fluctuations. Group operating income (EBIT) for the first half amounted to CHF 12.8 mn, which corresponds to a decline of CHF 3.2 mn (–20.3%) compared to the prior-year period. This is largely attributed to the lower operating income reported by the Systems Division. The Group’s EBIT margin for the period is 4.5% (5.9% in the prior-year period). In the Systems Division, operating income declined by CHF 3.7 mn to CHF –7.4 mn, resulting in a negative margin of –3.8% (prior-year period: –2.0%). The Services Division managed to increase its EBIT slightly by CHF 0.4 mn to CHF 22.3 mn, resulting in an EBIT margin of 23.7% (prior-year period: 26.3%). Group net income amounted to CHF 8.7 mn, a decline of CHF 1.3 mn from the prior-year period. Ongoing efforts to lower and optimize operating costs, ranging from value engineering to a greater emphasis on global procurement, are gaining traction as planned. The inauguration of a Global Support Center in India that will support Group activities around the world, primarily in the areas of engineering, IT and contracting, marks another step forward in the optimization of the company’s cost base. Moreover, the first frame for one of Burckhardt Compression’s process gas compressors was cast at Shenyang Yuanda Compressor’s foundry during the period under review. This will reduce costs significantly in the future. Total assets at the end of September amounted to CHF 749.5 mn, which corresponds to a decline of CHF 61.5 mn or 7.6% compared to the figure reported at the end of the 2016 fiscal year. The main reasons for the decline were the smaller backlog of work in progress and a reduction in accounts receivable. The net financial position declined by CHF 8.3 mn compared to the end of the 2016 fiscal year. The decline includes the payment of the purchase consideration of the acquisition of CSM in Edmonton, Canada. The equity ratio climbed from 39.1% (year-end fiscal 2016) to 41.3%. The integration of Shenyang Yuanda Compressor is on track and will be concluded by the end of 2017. Technical collaboration with Arkos Field Services, the US company in which Burckhardt Compression holds a minority interest, is likewise progressing according to plan. In conformity with its strategic roadmap, Burckhardt Compression has strengthened its local footprint in the services business by acquiring the Canadian company CSM Compressor Supplies & Machine Work Ltd. in Edmonton in June and setting up a new partnership with Kompressorteknik ML AB in Sweden. Our main target markets are expected to remain very challenging throughout the 2017 fiscal year, particularly in the marine compressor business within the gas transport and storage markets. From today’s standpoint, the positive development in the Services Division is expected to continue, whereas the Systems Division is not expected to experience a positive trend in orders received until fiscal year 2018 at the earliest. 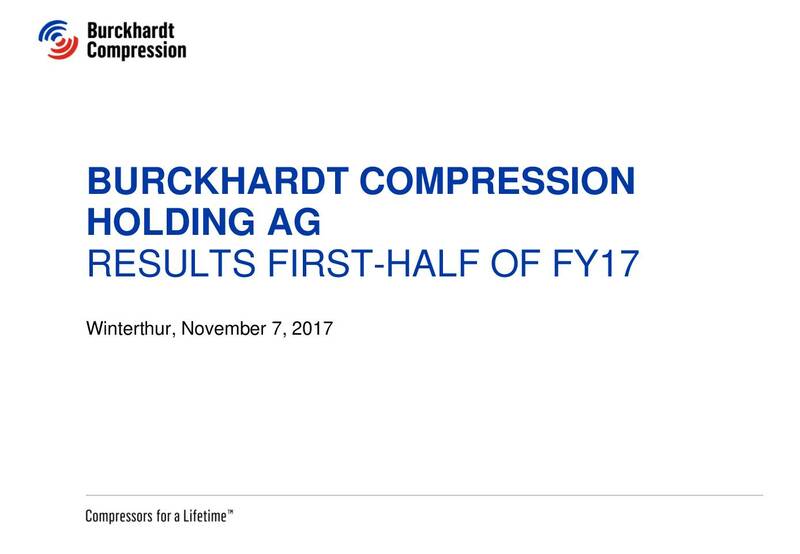 Burckhardt Compression expects sales for the fiscal year 2017 at previous year level and an operating margin between 6% and 9%. Burckhardt Compression expects the EBIT margin to be higher from fiscal year 2018 on.